Note taking apps for Mac are a fun category to look at because of the variety of options on the market. There are apps like Evernote which aim to be an “everything” bucket and apps like SimpleNote that only handle plain text notes. You then have apps like Bear and Apple Notes which aim to live somewhere in the middle. When I am looking for the best note-taking app for the Mac, I am looking for a few different things: sync to iOS (and web if possible), easy to add new notes, and easy to look up existing notes. I’ve used dozens of apps over the years, and I have opinions on what a note-taking app for Mac should look like for my use cases. Most of the apps offer free trials, so I advise you to check them all out. I’ll run through a few of the apps, and then I’ll help you figure out which will be the best note-taking app for you to try. When looking at macOS note-taking apps, your needs may look drastically different from what you’ll want on iPhone and iPad. On the iPhone, speed of starting a new note might take priority. On the iPad, handwriting integration with Apple Pencil might take priority. When looking at the best note-taking app for the Mac, the factors that are important for me are: ability to organize in folders/tags, speed of search, and ease of adding new notes from other apps. Based on the experience I’ve had with note-taking apps for the Mac, I came up with six great options depending on what’s important to you. Evernote is one of those apps I sort of don’t remember not existing. It originally launched in 2008 as a web service and has added clients to pretty much every platform over the years. It’s a perfect example of the everything bucket. You can load anything you want into Evernote, and it will sync it everywhere else you use Evernote. I used to hate Evernote, and then I loved Evernote. My problem with Evernote has a lot less to do with Evernote, but more than there are just more polished alternatives. I feel like OneNote is a better everything bucket, and Apple Notes is built into every Mac and iOS device. Evernote isn’t bad, but I just don’t love it. For me, it’s just a service that stayed stagnant while others around it evolved. One aspect of Evernote that’s really well done is its web clipper for saving information from webpages. Evernote offers a free version, but I would advise the paid upgrade if you plan on using it. It’s $8 per month or $70 per year. Upgrading gets you 10 GB of monthly uploads, offline notebooks, forward emails into Evernote, and automatic OCR scanning of your documents. Evernote can be downloaded for free on the Mac App Store. Apple Notes is built into every new Mac, and your storage is included with your iCloud account (5GB for free). It has some nice integrations built into macOS where you can add Safari items right to Notes. Like Evernote, you can add text, files, images, and more to notes. You can organize notes in folders (and subfolders), but it does lack the ability to create new notes via email like Evernote. That feature alone makes me consider Evernote from time to time. Is Apple’s Notes perfect? No, but it’s hard to see where it won’t fit the needs of most people. If you have somewhat basic note needs, then Apple Notes will probably work for you. The cost of storage is built into the cost of iCloud, so you can create thousands of notes with images, files, etc. without worrying about running out of space. 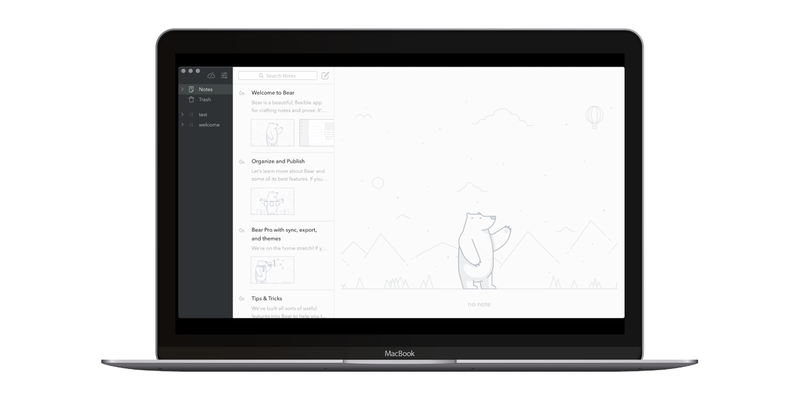 Bear is a well-known Note taking app for macOS (and iOS) with a simple design, large feature set, and robust sync. It reminds me of Apple Notes on steroids. Bear looks very similar to Notes.app, but it includes a lot of features Apple decided not to build in. A few of them are Markdown support, note linking (linking to other notes), multiple themes, export to Word, hashtag organization, and more. 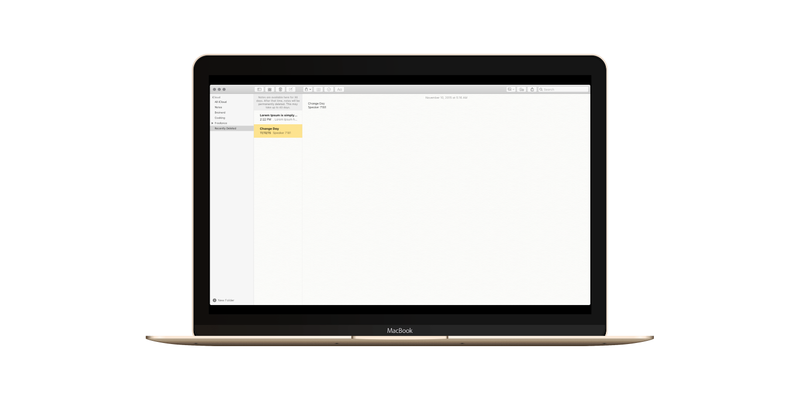 If you really want to like Apple Notes, but it just doesn’t do quite enough for you to be considered the best note-taking app for Mac, then I would check out Bear. It’s easy to learn the basics, but it can do a lot once you spend some time with it. Bear is a free app, but a $15/year subscription unlocks sync between all your devices, over a dozen themes, and export options. Bear can be downloaded for free on the Mac App Store. On the Mac, Microsoft Office has gotten a lot better in recent years. The team at Microsoft has spent more time and resources making the apps feel more native to macOS versus just a cheap Windows port. OneNote is one of those apps that you probably have on your laptop but might have never opened. It’s actually really good, though. It’s a lot more robust than Bear or Apple Notes, and it’s more in line with the type of app Evernote tries to be. It can sync just about anything, and it allows you to organize it in almost any way you want. 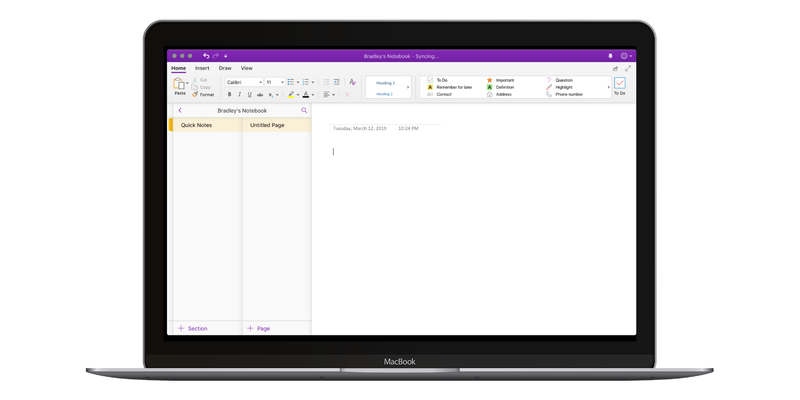 If you work at an organization that is heavy into the Microsoft ecosystem (and you use a Mac), I would not hesitate to recommend OneNote to you as the best note-taking for the Mac. OneNote can be downloaded on the Mac App Store. Simplenote is another one of those apps that I purchased years ago on iPhone before Automattic purchased it. For a long time, there wasn’t a macOS version. Users could use SimpleNote on iOS and then an app like Notational Velocity on macOS. Comparing Simplenote to something like Evernote or OneNote doesn’t seem right as they are completely different. Simplenote allows you to collaborate with others, supports Markdown, and uses tags to organize. It’s all about plain text, though. If you want something to support images, handwriting, etc, you’ll have to look elsewhere. But if you want a plain text note-taking app for Mac, I would check it out. 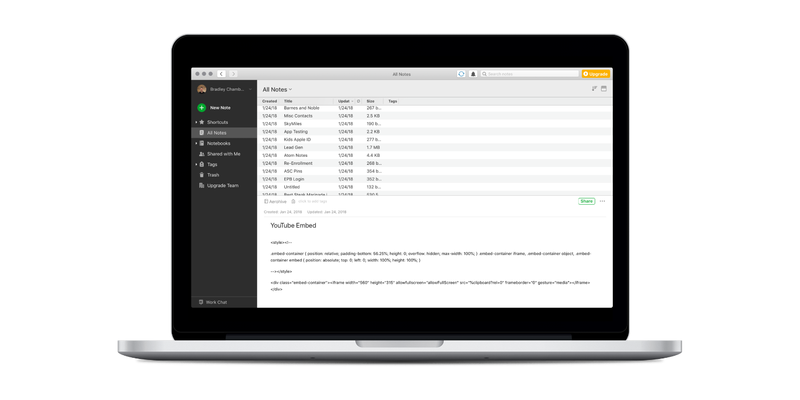 SimpleNote is a free app on the Mac App Store. I mentioned Notational Velocity with Simplenote, and it’s another app you should check out. It can sync with Dropbox or the Simplenote API so you can access your notes on iOS. 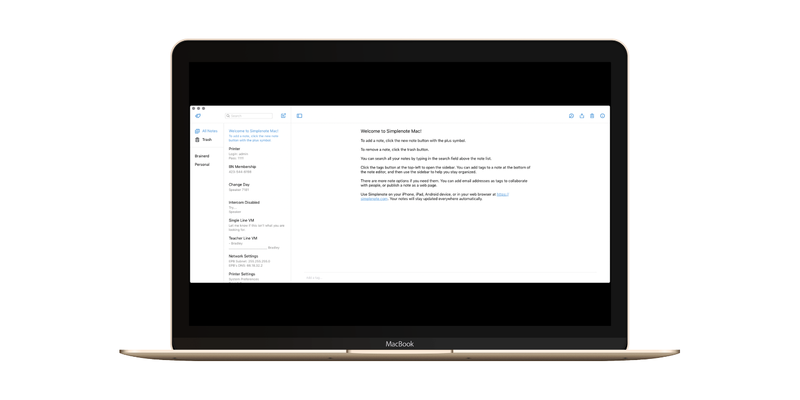 It’s a simpler version of Simplenote, and it feels more native to macOS. Notational Velocity excels at speed and search. If you have hundreds of notes that you want to be able to sort through quickly, then you’ll want to give it a try (it’s open source). Notational Velocity can be downloaded for free. When looking for the best note-taking app on the Mac, you really need to decide what kind of note-taking app you want to use. If you want something for just plain text notes, check our Simplenote or Notational Velocity. If you want something for notes, images, PDFs, etc then check out Evernote or OneNote. If you want something in the middle, I would go with Apple Notes.